First, apologizes to all the mothers of eight kids (and more) that I know. You all do a fabulous job, much better than I, and I hope your good reputations are not impugned by what I am about to reveal about my own wayward ways! A wonderful (non-Catholic) reader, "Anon 11:11", is the latest to ask me about having eight children. Her words are in red italics. I would love to hear the logistics of having 8 kids. I will stick to logistics in this post, then, and save the spiritual side of things for another post. Like I said, I'm pregnant with #2 now, and I can't imagine having any more kids. Taking care of my 3 year old through a miserable pregnancy is just about breaking me. It's normal for you to feel like your breaking at this point, because (aside from feeling lousy) you are in "The Mommy Tunnel": Your children are little and totally dependent on you for everything. You have no older kids (tweens or teens) to help you, and your little ones can't do much to help themselves. This is a passing phase! A mom can't objectively judge her long-term future childbearing at this stage. When you emerge from the tunnel, your whole life changes. In my own experience, I was surprised to find that having four children was much easier than having three. I love my kids, and I love being a mom, but I think I'm at my limit. 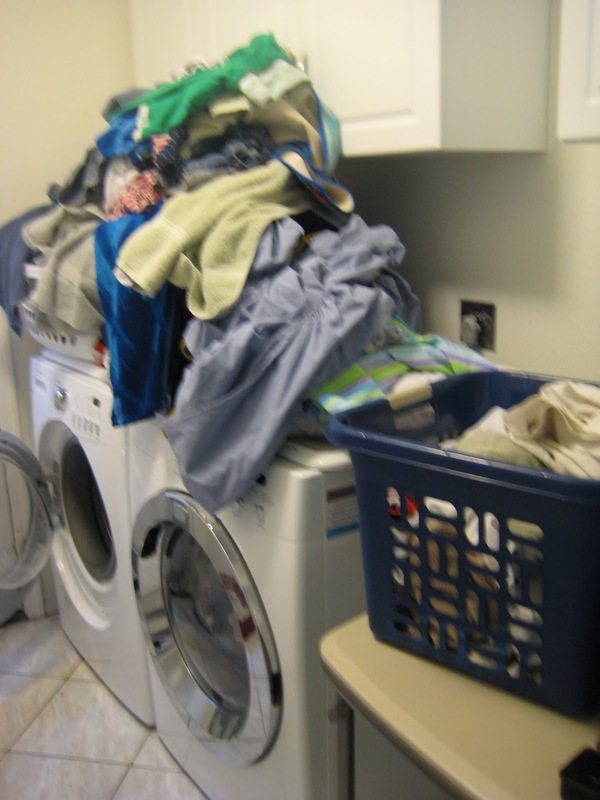 How do you handle laundry? Ahhhh, laundry. It took me almost twenty years and eight children to figure out the obvious: All is well with the world when you stay on top of the laundry. Keep it moving. That's all. If you make sure you are moving your laundry every day (and teaching your kids how to fold or put away), then it's really not so bad, and even becomes relaxing. Photo taken about a year ago. For perspective, that is a large white laundry basket on top of the washer there, to the left. Trust me, it is much worse than it looks, ha ha! But today things are different. I read a life-changing blog post (ironically written by another blogger named Leila), which said that if you want a peaceful home, stay on top of just two things: laundry and meals. She was so right! I started being more disciplined about daily laundry, making it a priority, and finding a routine. Now that it's a habit, it's not such a big deal anymore. True confession time. I don't grocery shop, because I don't cook. I am a disaster in the kitchen (I cannot multi-task). I felt such guilt about it years ago that I almost stopped having babies after four children. I didn't think I should bring a fifth child into the world because of my lameness at such a basic part of motherhood. But then I realized that God had already provided the answer, in the form of a dear husband who actually enjoys cooking. He and I have struck a nice balance to keep thinks running smoothly in the two areas I mentioned earlier: I am on top of the laundry, and he is on top of the meals (grocery shopping and cooking). Yes, he grocery shops for the family, and there are two reasons why it's he and not I. First, I am paralyzed (or awestruck?) in a grocery store. I can make huge life-changing decisions easily, but if you tell me to buy a can of beans, I will stare endlessly at all the varieties, not knowing how to decide. If I shopped, I would be gone for hours! Second, on the few occasions when I have gone grocery shopping, I have come home with lots of amazing snack food, but not much in the way of meal ingredients (the one who cooks really should be the one who shops, for nutritional as well as financial reasons). I know some folks who've had a good experience with home delivery of groceries, and I myself have begun to order my fruits and veggies from a local farmers market online, with a convenient weekly pick-up at my kids' school. Since I never know what items will be included, and since I hate waste, I have begun googling super-easy recipes for the food I receive, and I'm actually making some healthy, delicious stuff with those fruits and veggies (not full meals, of course). I'm kinda proud of myself at this turn of events!! One other logistical thing: If at all possible, do not take small children along when you are shopping! Try to shop in the evenings or on the weekends so that the kids can stay home with your spouse. I do everything in my power never to bring small children out to any stores by myself. In fact, I can't remember the last time that happened. I either go sans kids, or I have an older child or my husband with me. You may think I'm a wimp, but it works for us, and it's part of the reason I've been able to have lots of babies and stay (mostly) sane! I married a man who throws things out with an obsessive flair (that's a story in itself). There is clutter here, as in any large household, but not much. We throw a lot of things out, and we have stopped acquiring things. This tendency to be detached from "things" (including toys) gets stronger as the number of children increases. I would love to throw out or donate most everything I own, but I don't have enough time yet. When the last child goes to school, the massive purgation will begin. Kids' bedsheets are changed very rarely! If they bathe before they go to bed, their sheets aren't really getting dirty anyway, right? Okay, there is the occasional bedwetting, and that does motivate me to change sheets. Another great discovery: Older kids can change their own sheets! It's a life skill they need, correct? It would be a disservice to them if I didn't let them do it. keeping track of what's going on in each one's life? It's funny, but I have never even thought about this as a problem or concern. I don't have time to micromanage the kids' time or schedules (which is a good thing), but because I have to coordinate everyone's day, I am always aware of where everyone is and what they're doing. As far as homework, I only help the little ones, and only when they need it -- the older kids don't expect or want the help. When it comes to their moral formation and safety, however, I am all over it. I have their passwords to facebook accounts, and they fully understand that their texts and emails are subject to (unannounced) parental oversight. We give them privacy as long as they are trustworthy, but they also know that as long as they are minors and in our home, privacy is not a right. Our children know that their parents love them and will keep them accountable. This approach has worked well. talking to your husband with a moment of peace? This is the absolute glory of having teens! We have built-in babysitters! I never thought that the day would come, but when our oldest finally was able to sit for her siblings, my husband and I started going out on dates, even on a whim! Currently, we have four teens! This is not only like having four sitters, but also like having four nannies! Think of it this way: We have eight kids, but it's almost like we have four young children and four nannies to help out with those last four. That seems doable, right? Before folks start yelling about how "unfair" it is to "burden" the older kids like this, I need to say a couple of things. First, every single older kid is head over heels in love with the little ones. And they all (old and young) ask for a new baby pretty much weekly. The babies are the light of our lives, and they'd do just about anything for another one. (Don't believe me? Ask them.) Second, I have absolutely zero guilt or angst about expecting all family members to do their share of work and to help others when needed. I don't do the coddling thing, because I don't think it's helped the last couple of generations who were raised that way. I want my children to have responsibilities and learn to care for each other, and I will never apologize for it. who's grown out of what clothes for what season? Yeah, that whole thing is a pain. One thing helps us here in Arizona: No hard winters. So, the majority of the year it's shorts and t-shirts. When we switch to jeans and sweatshirts, I do a little inventory. It's not always fun, but in a way it's cathartic. Another thing that helps me is that my oldest three kids are done growing, so their clothes are their clothes. The rest of the kids are all boys, so that helps, too, as the clothes just keep getting handed down. For in between sizes, I just stick those clothes in a box with a label (name and season) for the next kid in line. I always say that if I had to do all the things that our culture says must be done for kids today, I couldn't have so many kids. So, each non-driving child gets one or two activities a year. Maybe one sport, maybe music lessons. For the smaller ones, maybe nothing at all for a year. I used to do Gymboree with every baby/toddler and start kids in T-ball when they were 3. I've let that go, with no ill effects. They are all just fine. In fact, we are all happier, and the kids play with each other out in the backyard, where we installed a sport court and a concrete track for scooters and bikes. Basically, it's simplify, uncomplicate, don't try to follow the Joneses. Angst and guilt get in the way of good mothering, so I've tried to drop that. It's non-productive. Another thing to consider: Children grow up and move out. I have one who's already gone, and another one leaving in the fall. By the time baby #8 came, baby #1 was already at college. The years do fly by. When my first sweet girl left, I missed her terribly. It was a blessing to have little ones still at home to cuddle. Last thought: Anyone with more domestic skills than I have (i.e., everyone) can handle the logistics of raising eight children better than I can. But there is an intangible in all of this, of course. Have you noticed that big families these days are almost always religious families? There's a reason for that. Is having eight kids "sketchy"? Can you tell me about discipline? I need help In This area. Oh, I love love love love love this post!!!! I've wanted you to do a mama post for months now! YEA!!!!! AS a teacher, let me back you up on the activity thing. A long-term study of the top Harvard graduates sought to determine what they had in common. Was it stay-at-home moms? Private education? Fruit loops for breakfast? Velcro shoes? :) NO! The #1 common link for the TOP HARVARD grads was PLENTY of UNSTRUCTURED PLAY TIME. In other words, they were NOT being shuttled from piano to dance to karate to basketball to voice lessons and so on. They had time to develop their imagination and learned to entertain themselves. So sigh in relief, parents! You do NOT have to be a taxi-driver for the next 20 years to ensure your child's success. QUITE the opposite! I still love that towel Sew made you. And your husband....I've said it before and I'll say it again...what a cutie!!! Such a fabulous post, Leila. You make me want to go adopt 7 more right this instant! :) (All in due time...) Love you, friend!!! Great post! I was thinking the other day that if they were all babies at the same time, that would be nuts, but my two year old is crazy independent and self sufficient, even helping bring me burp cloths and definitely cleaing up spills and toys himself. The things you described are so good for kids! I imagine your kids all have dif strengths and weaknesses and personalities and that helps too in that they all find their niche around the house etc. I am relieved you aren't superwoman in the kitchen, as I am not, lol. The good and the bad of having little ones flies by way to fast. I totally agree about grocery shopping. Even with two I try to leave them at home! and you just relieved any and all guilt about how my 2 year old does pretend play 99% of the time (while his cousins were in ski lessons by 3, gymboree, etc). I do pretty good at shopping. Over the years I've "learned" how to shop smart. Again, in my early years, I had a lot of trouble trying to figure about "the basics", what to buy in bulk and how to stay away from too much snacks. But cleaning, laundry, organizing, forget it. I do keep trying though, I'm stubborn that way. And I think my husband likes it, darn it. My mom used to say it was great to have our cousins over - they had six and we had six, which made a dozen rowdy kids, but she swore it was easier b/c everyone had someone to play with :). Growing up, the older kids always had weekly jobs - we'd rotate mopping/vaccuming/dishes/making lunches/etc. My mom did laundry, but we folded and put away. As we got older, we took on more of the household and outdoor chores (mowing, weeding). Big families work well, I think :). Everyone learns how to work hard and everyone learns how be self-sufficient - which is pretty important when you send kids out into the real world. Oh, and as far as "stuff" goes - my mom would shop for Christmas and birthdays year-round, stashing stuff in the attic until the day rolled around. Shopping for stuff out-of-season and spreading it out throughout the year helped us celebrate even when money was tight. The rest of the year, we had the GREAT OUTDOORS and that was really all we needed :). Plus, when you have lots of siblings, you have a huge support network which only gets better as you get older - which is really important once you're parents are gone. I'm very thankful for my brothers and sisters! I would love it if we could have at least four kids. I hope that adoption credit stays around! Love this, Leila! I just read it aloud to my husband. It was so helpful to read and your philosophy on running a household and parenting is awesome! I totally agree with what you said here, and I'm taking notes, haha! Great post Leila! Thank you so much for taking the time to write your thoughts on motherhood. Gotta get started on my own big family :) Thanks for the inspiration! Have to say, i have come to the conclusion that we MUST get a laundry schedule going around here. 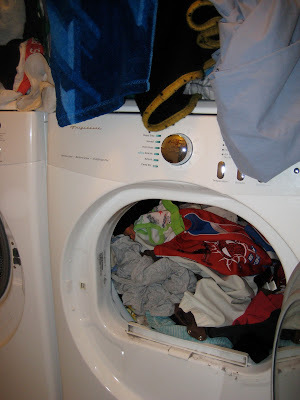 Baby #5 is due in July and we just have to figure out how to get something washed/dried/folded/put away every day. I can definitely have the oldest fold and put away...so it's up to my husband and me to get to that part! And my husband does the cooking and the grocery shopping, too! I LOVE IT! There's no way I could do laundry, grocery shop and cook AND do the things I do at my kids' school and work outside the home full-time, so I am SO happy to have a husband who pitches in at home! You're so right about the "mommy tunnel." When my 3 were 5 and under and couldn't imagine more. Now, at 41 I'm praying God will grant me one more. All true, Leila! 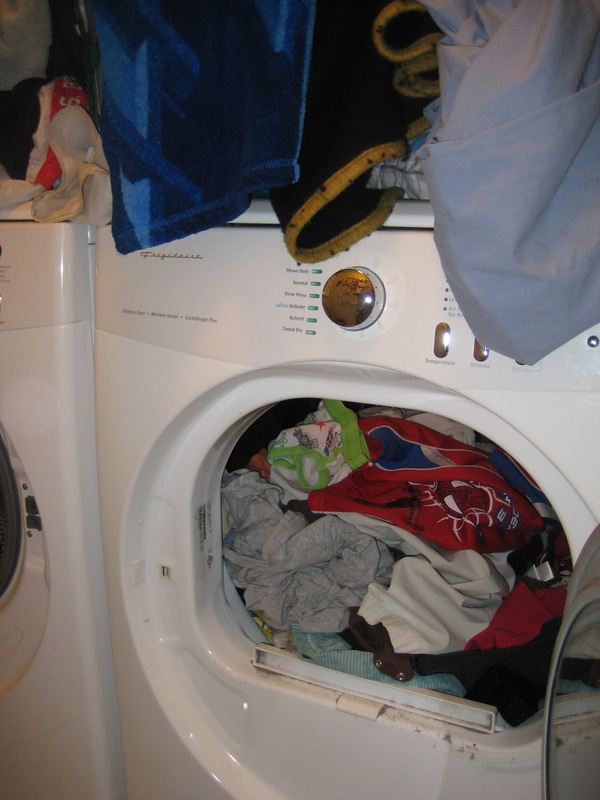 Up until the time we had 4, I was buried with laundry (dirty AND clean!). I just couldn't keep up and it was such an eyesore. Having a "laundry day" just wasn't working. The sight of all those clean cloths was daunting and I never could fold them all. Then I learned to do a load a day. One load is easy. It takes about 5 minutes to fold and put away one load. I timed it. Everyone has 5 minutes to do this. With 6 children now, we're up to two loads a day now but I almost never have more dirty clothes than my hamper can hold at the end of the day. I have a sorting hamper with three bins, each day I just wash the bin(s) that is/are the fullest. As for toys, you don't need very many toys at all when you have siblings. And yes, your hubby is a total hottie. And your kids... pretty amazing, too. I nannied for a family with 8 kids (now 10) and this makes me miss them so much!!! Dare I say you have it "easy" compared to them-their 8 were all under the age of 11!! Big families are such a blessing. If anyone doesn't believe that-go spend time with one and see for yourself! I'm currently in the tunnel with my 3 (ages 6, 3, and 1) and it's exhausting. So exhausting, in fact, that I'm praying that God will postpone blessing us with #4 for a while yet. It wouldn't be so bad if I didn't have to work full-time and commute 2.5 hours per day (round-trip), but between work and a husband who works full-time AND does full-time college (and thus has very little time to help out), I feel stretched sooooooooooooo thin. Thanks for the tips, and I'm glad to hear it gets better! I'm looking forward to the built-in babysitter phase... it is next to impossible to find a babysitter right now and it's tough not to be able to do a date night with my husband occasionally. Yay... i want eight kids now! We are only at two so far but we are working at it. Loved this post. I love this post and it reminded me of all the things I tell my husband about with large families! I remember before I got married my grandma (a mother of 7) asked me how many children I wanted to have and I said "8" or some number like that! She was shocked!!! My husband and I laugh about that now and enjoy our one right now and look with anticipation to what God has in mind for our family in the years to come! I love your laundry/cooking system with your husband. My problem with the grocery store is that I will go in to buy 10 items and will leave with 30 items, my husband will go in for 10 and leave with 10 - saving tons of money and he does alot of the cooking! Laundry is my thing too! Thanks so much for this post!!! I love seeing the Leila behind-the-scenes! I am totally with you on encouraging (demanding) siblings have some responsibility towards each other. It is sad that the modern world view has no problem with children watching questionable programming on TV, spend all day in front of violent video games, communicate through texts, and be overscheduled, but God Forbid someone "take away his childhood" by letting him get his younger sibling dressed in the mornings. Sigh. You are correct, laundry and meals are two of the biggies!! I totally agree on the unstructured activities and the helping out in the family. My almost 10yo ds knows his way around the kitchen like nobody's business. And he regularly volunteers to get breakfast and lunch started. Of course simple things like cereal, toast, sandwiches etc But still he is learning valuable ways to serve others. Right there with you Leila, with 6 kids ages 18 to 2 (and hopefully adopting #7 soon!) and my part-time law practice, most people look at us with a mix of fear and barely concealed pity...wrong! We have fun, so much fun, together and apart, we all take the love and skills we have learned in our home and bring them out into the world. Big kids are not responsible for the primary care of younger sibs but WANT to play with them, role model good behavior, and enjoy their company.... A common sight here on Sunday afternoons is my 6ft 3in 220lb. 17 yo cuddled up with his 4 yo brother for a nap! "Yes, he grocery shops for the family, and there are two reasons why it's he and not I. First, I am paralyzed (or awestruck?) in a grocery store. I can make huge life-changing decisions easily, but if you tell me to buy a can of beans, I will stare endlessly at all the varieties, not knowing how to decide." What a wonderful, life-affirming post. So glad I found your blog. I grew up the seventh of ten kids, but in South America, where Mother had a cook, a gardener, a nanny, a driver... we just played and played! (I am glad I was actually allowed in the kitchen to help Cook sometimes, I had to beg though, but learned a lot!) I live a very different life now with my own seven kids, but I would say almost everything to others exactly as you said. 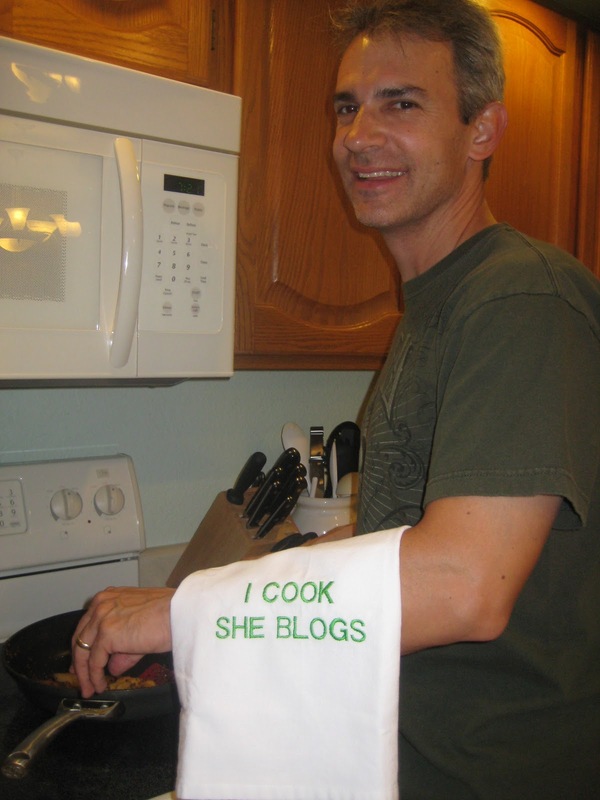 My husband also loves my blogging and grocery shops for over ten years! But I am the cook--I like making homemade meals with our garden produce and natural meats from the farm. The older kids love coming home... to eat! So, so true about how it is so hard right before your oldest child is old enough--from then on it is so much easier. And yes, they looove their younger siblings! Thanks! I will link to your blog from mine today because you are fun and so inspiring! God bless you! This is terrific!! I laughed out loud several times :) I do try to remember this time of small children and pregnancy is an intense "season", but it's not forever. I WANT to be able to handle more kids, but I DON'T want to become one of those stressed/annoyed/crazy mothers, haha! That pic of your baby's foot in the laundry is the cutest thing I've ever seen. I really like your philosophy on the big kids helping with the littles. I totally agree. I also really like your apporoach to activities. My son is 3, and everyone is starting to ask me what sports/preschool/etc I'm enrolling him in. I always looked kind of confused because I'm not interested in scheduling our week like that. (Not only for his sake, but I don't feel like keeping up with it all either!) I just kind of mumble something about how we play outside and sometimes go to the library! I do sometimes think I could probably get more done if my son had a sibling to play with. I like what you said about going to the story with small children. I got so fed up going grocery shopping with my (then) 20 month old, my husband made the decision that we would get our groceries delivered b/c he was tired of watching me stress about it! My groceries are now delivered weekly, and it has changed my life! I also really liked the part about less is more and dropping the mommy guilt. Sometimes I can get so wrapped up in feeling like a bad mom because I don't have 1 scrap book! I so enjoyed this post, and I really look forward to reading about the spiritual side, too. I think modern parents worry a lot about "parenting." There's that attachment-parenting trend going on, and helicopter parents. I think people obsess about every little thing regarding their babies and kids and in fact end up over-stimulating them and wearing themselves out in the process. I believe this is why people often ask, "you want/have HOW MANY??" Personally, I am not going for any specific # at all. I don't take chances, but I don't have a plan, either. I think if someone wants to have a dozen kids, go for it. But if someone else is too overwhelmed to even think of having one, that's their prerogative, too. My girlfriend was asked once at a restaurant, "Your boys are so well-behaved. Our daughter is one and we were wondering when she'll outgrow the tantrums. When do you get your life back?" She answered, without skipping a beat, "If I didn't want my life to change, I wouldn't have had kids." I agree, you have a very attractive husband :) And the dishtowel is hysterical! I love this post! My goodness do you have things worked out at home! I have to say, I two good friends that have 6 kids each and their house is more organized than some of my friends with 1 or 2 children. I wish my hubby cooked~ You lucky duck! Oh my goodness!! I love all these comments! I am learning and growing just by reading them! You all enrich me and inspire me! Thank you!! When my husband gets home, I think he will appreciate some of the comments, too, ha ha ha! Beth, in twenty more years when I figure out the discipline question, I will get back to you, ha ha ha! Sounds familiar, I just have one more...., and do ALL the cooking! I am just growing to love you more and more, Leila. We have SO much in common! This was such a fantastic post, and a gift to women. Thank you for having the courage to ENcourage. We need it. Leila, I love this post! I am from a family of 5 and although it was crazy at times, I always enjoyed having siblings to play with. us older kids always helped to take care of the younger ones. I wouldn't change it now that I look back on it. I joked last night when my family was over that I couldn't wait to have 5. My brother looked at me like I was crazy! LOL! This is so encouraging! Right now, I'm just praying for #2 to come in the next couple years! I love this post! I read it to K last night and we both laughed. I love hearing the logistics of a large family and hope it is something we will experience one day. And I agree...your DH is a total hottie! Yay! Photos of some of the Bubble Children :)! This is great - as a teacher, I find it much easier to deal with a whole classroom full of children than just one or two! What a great post! You make it sound so much less-daunting than it may appear to be to the outside world. Thanks! This was so encouraging!! Since I have baby boy #4 on the way, I was VERY happy to read that 4 was easier than 3. We'll see. I might be e-mailing you in a few months begging you to clarify how that could be true! Woohoo! I love to see "behind the scenes" Leila too! :) And love to hear how big families do it (as I hope to have a big family one day and need lots of tips!!) :) I think that's why I'm drawn to watching 19 kids and counting....it's inspirational to see how they do it...the day to day life stuff with so many children. I could read many more posts like this one! Sometimes I get overwhelmed thinking about having lots of kids, and wonder if I could ever do it. But then I realize that in my head I'm thinking that they'd all be the same age at the same time! Ha! I forget that the older ones keep getting older and more independent as you have more little ones! Of course the older ones would help out and do a lot of things on their own...it's not like you're changing diapers and filling sippy cups for 8 2-year-olds! You're not octomom! This is seriously one of the most important posts on love for a lay Catholic ever written. That's it. The book MUST be written. Talk about healing the culture. GIRL. You wow me beyond belief. I can't get enough of you. Even if all of us can not have such a big beautiful family we can follow these maxims. Simplify and Love. That's my motto, too! A family should exist to give hospitality to each other and the world. This post was really insightful as to how you manage having such a large family. However, I have a serious question--- how do you suggest that working class and poorer families manage so many children? From your posts, it seems that your family is in a pretty comfortable economic situation, or at least well enough off that you can stay at home, without worrying about food, keeping a roof over your head, etc. What about families that aren't so fortunate? How do you suggest that they raise big, robust Catholic families without going broke? Leila: Your post made me a little teary. I am one of eight children and I still remember watching my mom do the impossible. She had eight babies in eleven years and must have spent much of her time pregnant, changing diapers, nursing, doing laundry and just stacking us up like cordwood when she needed to get something done. She always claimed that once she had two, all the others were easy... just a question of organization. It is also of note that we all had jobs around the house - even the little girls (a group of which I was a part)- so things got done (if not done well). I am now much older and I can't imagine life without all my siblings and all their various children. My mom has been dead for 10 years.Your post made me miss her with a big stupid grin on my face. Blipfillypicklepoo, that just made my night! Thank you for the honor!! I am sure your mother is/was a saint, and I only hope to be as good as I am sure she was!! Anonymous, that is a great and important question. It's not easy in this materialistic society to raise a large family on a small income. When we started out, my husband was unemployed. His first real job had a salary of $26,000. We had three kids and a small house (my parents helped with the down payment and also with some of our expenses... so having a supportive family helps). We are twenty years in and just starting to feel like we can breathe easier. Even with a good salary, it's not easy to feed and clothe and house and entertain ten people. However, we follow certain guidelines, and we live within our means. I am not above shopping at Goodwill and second hand stores. Wal-Mart, too, but I love to get some good quality stuff on sale. I don't buy full retail, but I am guessing most people already do that, too, so that's no great tip. Also, our oldest kids have jobs and pay for a lot of their own entertainment and clothes that they want. I will not cry poor, since we are not poor, but I will tell you that I thought of three big Catholic families right off the bat (make that four!) who are friends of mine and who are living on very little. Some with serious financial problems. I would say that any financial problems are not a direct result of having a big family. I think they would agree with that, too. It can be done, and I watch it being done all the time. But since I am not in a position to answer the question, I will talk to my friends and see if they have any insight, and then perhaps they wouldn't mind doing a guest post! Great post Leila! I have heard that the more kids you have the easier it gets and it makes sense. It is easy to get the "Mommy Tunnel" vision when you are just starting out. I'm emailing a kind of related question to get your input since you are such a Mommy pro! Help! I just found out that we are expecting our 8th baby. We like to think ourselves "generous" rather than "careless." What do you say? Alisa, did someone call you careless? If you are married, then children are a natural and welcome consequence of marriage. Everyone used to understand that simple truth, even if life was hard. In this day and age, having eight children is a generous offering. Hi there! I just found your blog from a post you have up on lifesitenews.com. Thank you for writing this--I'm in that trap of being pregnant with my second while my first isn't even 2, and I'm wondering how you ever get back to feeling normal. Thank you for your witness to Christian motherhood! Mary, congrats on #2! Trust me, it's so great to have your children grow up together. And this is the "new normal" but then it will change when they get older. It's forever changing. God bless! You don't see large families very often, and passed 4 kids, you're definitely an alien in this world! It's beautiful to see couples who open their life to many kids. Catey and Unknown, thank you so much! It's so nice to know you are "out" there, living the same blessed craziness! I'm a mother of two, maybe preparing for #3 in the coming year, probably having a large family in the years to come, and living basically an american lifestyle - cooking, cleaning and doing laundry myself (Brasil is like India or Bolivia, it`s quite cheap and common to have a maid). But you gave me golden advice: to be on top of meals and laundry. I've been doing that even though I have never noticed I've been priorized meals and laundry! My house isn't the cleanest, nor the most organized, but I do my best in order not to go crazy! I wonder the age kids start being really helpful: five? seven? eleven? even older? What would you say? But it all goes so fast. It seems like you never will get out of the small child stage, but then they grow up and you seriously cannot believe it. It's stunning how fast it goes by when you look back…. Thank you, Leila! My oldest is 3 years old, so it might take a little long yet so he can be helpful (by now, he barely speaks well!). Anyway, you'll get a little more of brazilian readers because of this article (http://noticiasprofamilia.blogspot.com/2011/10/por-que-eu-nunca-deveria-ter-tido-oito.html), which is a translation to Portuguese of a recent post of you, on how you shouldn't have had 8 kids. Amazing post! Although Brazil does have this culture of having maids and nannies, people are stuck in that "2-kids-is-enough" idea. I'll keel following you! What a great post! I grew up in a family of nine, and the chaotic awesomeness of it is something I long to replicate in my own home someday. My parents were never well off -- Dad is a self-employed mechanic, and Mom stays at home -- but providence always kept us afloat (sometimes in miraculous ways). We never had nice cars, or a big enough house, or got to take vacations, and for Christmas and birthdays we received literally about a tenth of what our cousins and friends from smaller familes got. But I never felt poor. (In fact, my uncle once told my mom that we were a lot happier with our small Christmases than his kids with their big ones.) "Poor" for me was someone in rags begging in the street, like the poor people the saints helped in our picture books. We didn't have the fanciest toys but we were much more imaginative with what we did have than any of the other kids on the block, and we had a lot more fun. I wouldn't trade my childhood for anything. And someday I'm going to give my own children the same thing. I love your post, because this joyful side of Catholicism and the family life cannot be stressed enough, not when the world is constantly trying to say the opposite! Thank you for directing me to this post! I had read something about the Tunnel of Parenthood on another blog recently, and I'm glad to hear it again. Makes me feel less desperate (and slightly less crazy for contemplating a large family). I saw this on Facebook and as a Catholic mother of ten and a blogger it definitely caught my eye! The only thing I would add is the necessity of teaching skills to kids. As they learn how to do things, it frees me up. I have made sure they load/unload the dishwasher, do the laundry, mop floors, roast chickens, and comb hair. A five year old can unload the silverware while the taller and older kids do glasses. That kind of thing. I don't mop anymore and I don't buckle younger kids. The more kids I get, the older the kids get, the easier the mom gig gets! I'm expecting baby #6, hubby is a self employed painter...and all I can say after reading this post is "AMEN!, I wish I could meet her in real life because I'm sure we'd be friends!" My kids all have a laundry basket with their name on it, I avoid shopping with kids at all costs, minimize activities for the kids...and on it goes. I am a mother of 5 children and it is so true that the older kids can and do help so much with the younger ones. It is so liberating that our oldest can now babysit. It has been a life saver a few times when my husband and I each have our own meeting to attend and the same time. I have a situation that I would love to hear your take on. My daughter is finishing 5th grade and is often feeling like she doesn't fit in. As she says she doesn't dress like the other girls in short shorts or play a lot of sports, she isn't into expensive fashion, and she does well in school. All of those things some how exclude her from one group or another. As I see it she doesn't want to be like everyone else but she does want to be accepted for who she is. Do you have any experience with this in your family? Mrs. Spangler, does your daughter go to public school? I had my kids in a tiny little independent Catholic school for elementary school, and most of the families were my friends. All of the families were like-minded, devout Catholics. So, they had those formative years within a very Catholic culture, no real worries about that kind of stuff. So, I haven't had that experience. I say good for her for being counter cultural! And, if she is doing well in school on top of being modest, she is on her way to very good things. I think in time it should work itself out. If she is kind to all, she will be the one everyone wants to talk to and can trust after all the other kids have stabbed each other in the back, ha ha. I've seen it happen. Don't know if that helps, but I think it sounds like you have a great girl there. My children go to public school. I am proud of her for doing what she knows is right despite the fact that it is unpopular. She is a great girl. I just want for her to feel comfortable at school. She says at recess she watches everyone else. That breaks my heart. Hopefully the situation is being exaggerated a little. You never know. Thanks for your response. Yes, you should be very proud of her!! She will be a light to all. I'm thinking the part about recess is because she is not athletic? I was not, either. Either way, she sounds like such a good girl and she will find wonderful friends in her life. Maybe not this year, but hopefully soon! I've seen it happen. One boy I know who was always alone, in a sense, but grew into the most virtuous, wonderful young man. I love seeing him today. It was hard in grade school, but he has become truly stellar, and has friends AND his virtue! Oh my word, this was so encouraging! I have three children right now, but we hope to continue to add more. And I admit to fear and trepidation about how that's going to work out and when I feel like it's so hard just to manage three! Thanks for you honesty and encouragement. I love that your husband cooks and grocery shops and that you don't change the kids' sheets all the time. Ahh...that totally took some of the guilt off! Nice to know I'm not the only wife in the world who is a horrendous mess in the kitchen; like your husband, mine also loves to cook, and hence is in charge of all things culinary - except shopping. I love grocery shopping, so I happily buy whatever he puts on the list! Well, I was raised as an older daughter in a large family. My parents held attitudes toward child-raising similar to yours: "We can do this because we'll make the older kids do a lot of the work of parenting! Yay, aren't we amazing?!!!!" And I still resent the fact that they made themselves too busy by overburdening themselves just because "oh, we love babies" to invest in MY life while I was young. Love may multiple as more children are added, but time does not and neither do tangible resources. You are absolutely right--with a family that size, no one has TIME to let the older kids participate in organized sports or activities. Say what you will about them just "playing" together in the yard, but that is a shame for the ones who could have otherwise developed so much more. My youngest siblings are the only ones in our family whom my parents have been able to invest in that way--before, they just scrambled to keep everyone warm/dry/fed/educated in the basics. My youngest brothers have had the chance to pursue their own interests and develop lifelong skills and friendships during their highschool years, and I am jealous of that. My teen years were full of, well, babies. Pretty much just constantly taking care of the babies, all the time. And we loved the babies, of course! Only monsters would tell you they don't "love" a baby who is part of their family. But that doesn't make it right for two adults to parasitically absorb the lives of their older children that way. You are wrong to think it is "just fine" and "normal" to make your kids parent each other. It is a confusing and twisted way to have to grow up. My youngest siblings and I were never really able to just be siblings and enjoy each other's company, because my parents created the dynamic that made us older ones more like parents to them...but yet we were still kids ourselves. That is not healthy or good for anyone. Once I reached adulthood and became independent from the ginormous-sprawling-family responsibilities, it took me a long time to figure out what my OWN goals and dreams in life were. My parents maybe SAID they cared about me and my development, but frankly they never had time. And I think at least partly because of the fact that my childhood was filled so much with parenting and family-household responsibilities just as you describe here--I have no desire to have any children of my own. Ever. I had waaaaaaay to much of child-raising before I ever left home to want to start all THAT again. And you know what, there is a LOT more to life than absorbing it all in the kid-raising gig--c'mon: read a book, climb a mountain, join a club, learn an instrument, raise some pets. All of those things would have been nice, but there just is not time, attention, or money enough to go around when the house is so bursting full. Just be careful to remember that YOU are the one who chose to keep having babies, so YOU should be responsible for their care, not the other kids. The young people still in your house, who have never known life any other way than what you have made it for them, they deserve more respect and personhood than what you show. They just might actually have some developmental needs of their own, other than being your "built-in babysitters." That is such a rude and demeaning term itself--why do people still apply that to their children? I'm pretty sure both you and your husband would be offended if you heard your spouse describing your role in the household that way: "oh yeah, and the best part about marrying her and keeping her around... I now have a 'built-in babysitter' whenever I want to get away!" All my kids (two married now, each with a honeymoon baby) want large families. I don't know how or why that happened, but I'm grateful. My first daughter (and oldest child) is expecting baby number two at age 24, and my second daughter (with an eight month old) just told me this morning (before I read this) that she has "baby fever". All the kids are so grateful to have their siblings, who will be with them for long years after Dean and I are gone. What a blessing! I know multiple families who have many more children than we, and they are very, very close and loving, through many generations and ongoing. I am sorry your experience was so awful. Perhaps you felt unloved? If not, then perhaps you simply wanted more and more "stuff" and "experiences", instead of being happy and grateful for the simple things in life? We live in a culture that tells us we must have everything we want, or we can never be satisfied. What a crock! I could go on about that for years. And, just for clarity: My children have all learned to play instruments, all have been in clubs, all have been in sports (not all in the same season), all have climbed mountains (at least small ones here in AZ), have all traveled, and all read books. But I admit, we don't have pets. Whoops, they will survive. And they have a lifetime to have pets of their own if they so choose (so far they haven't wanted them). If they want more out of life when they leave the home, they have plenty of decades to "self-actualize". ;) So far, not one has the attitude of unhappiness, resentfulness, and bitterness that I see in your words. I am sorry for whatever went wrong in your upbringing (or your character development). I hope you will one day forgive your parents for their sins against you. It sounds like you felt quite unloved. I wish you peace. How about Ordered vs. Disordered? Watch, and pick a side. The Natural Family Planning Post!!! A couple of quick notes -- UPDATED with photo!